It’s here again, everyone’s favorite Hallmark holiday, Valentine’s Day, a chance for singles to moan and couples to glow (and sometimes gloat). Where might we find traces of this hallowed festival in the digital archive? Well, friends, I’m glad you asked. Today we turn to the Notable Women of Simmons Scrapbook Collection, which includes among its many clippings a handful of sweet, and sometimes silly, declarations of love. My favorite may be the scrapbook of Daisie Miller Helyar, a Vermont native who attended the women’s college from 1906-1910 and later became a librarian. The exhibit includes an excellent essay on the origins of Valentine’s Day, and also provides a remarkable window into the social life of young, educated women in the early twentieth century. 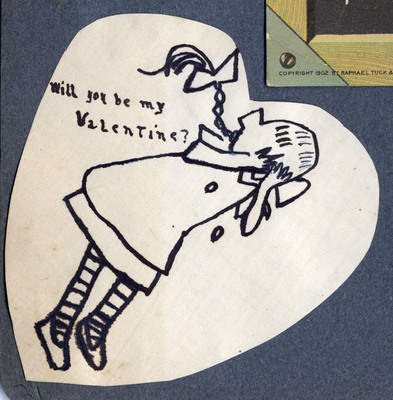 The curators note, for one thing, that “most, if not all” of the Valentine cards in Daisie’s scrapbook likely came not from her future husband but her friends. Below, you can read one love poem Daisie received. As Carroll Smith-Rosenberg showed in her classic 1975 essay, “The Female World of Love and Ritual,” romantic friendships between women were common in the nineteenth and early twentieth century. You can view two more below, and the rest here. Not everyone, of course, made cards by hand. For some vintage mass-produced Valentines , head over to the handsome Hearts Atwirl website and the Vintage Valentine Museum. Before I sign off, just one more recommendation: Jessica Helfand’s Scrapbooks: An American History, an extraordinary reading of the art of scrapbooking including countless beautiful reproductions. It just goes to show, sometimes only a book will do. Until then, you can check out Helfand’s website here. Stephen: Jessica Helfand here, writing from South Africa where a Google Alert just directed me to your site, and I am so flattered to be included. Will now bookmark and check in regularly here. PS: Might you consider adding Design Observer to your blogroll?